Factors that affect how big you’ll get include gender, genetics, training intensity, and diet. Genetically, you will have inherited a preponderance of fast-twitch muscles (more power, less endurance) or slow-twitch muscles (more endurance, less power), and it’s easier to bulk up if you have more of the fast-twitch type. It’s also nearly impossible for women to bulk up without steroids because their testosterone levels are so much lower than those of men. However, you can control your training intensity and your diet to get the best results possible. Lift weights heavy enough that you can only do 3-10 repetitions (recommendations and ideal strategies vary from one expert and study finding to the next, but typically fall within this range). Do 2-4 sets of each exercise. 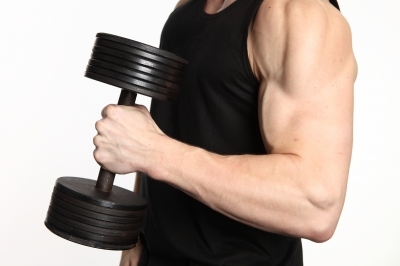 Train each major muscle group 2-3 times per week (this can be done with a full-body workout or a split routine whereby you work different body parts on different days; the latter strategy will enable you to work out more frequently, though research indicates that outcomes are likely to be similar regardless of which strategy you use). Focus on exercises that work lots of muscles simultaneously – for example, dead lifts, squats, push-ups, bench presses, tricep dips, rows, pull-ups, chin-ups, etc. Don’t train to failure on every set. It’s okay to do some exercises to the point of failure (when you can’t lift the weight anymore), but if you do this with every exercise, you’ll burn out and may start losing ground instead of gaining it. Another factor you can control is your diet. If you want to get bigger, you’ll need to take in enough calories to support that. Soybeans, 1 cup, provide 68 grams of protein. Bacon, 100 grams (around 4 slices) provides 37 grams of protein. Chicken or pork, 100 grams (around the size of a deck of playing cards) provides 27 grams of protein. Cottage cheese, 1 cup, provides 25 grams of protein. Steak, 100 grams (around the size of a deck of playing cards), provides 25 grams of protein. Salmon, 100 grams (around the size of a deck of playing cards) provides 22 grams of protein. Pumpkin seeds, 1/2 cup, provide 20 grams of protein. Peanuts, ½ cup, provide 19 grams of protein. Chickpeas, 100 grams, provide 19 grams of protein. Parmesan cheese, ½ cup grated, provides 18 grams of protein. Yogurt, 170-gram container or around 2/3 cup, provides 17 grams of protein. Edamame, 1 cup cooked, provides 17 grams of protein. Gruyere or mozzarella cheese, ½ cup grated, provides 16 grams of protein. Almonds, ½ cup, provides 15 grams of protein. Swiss cheese, ½ cup grated, provides 15 grams of protein. Sunflower seeds, 1/2 cup, provide 15 grams of protein. Cheddar cheese, ½ cup grated, provides 14 grams of protein. Baked beans, 1 cup, provide 14 grams of protein. Eggs, 1, provide 13 grams of protein. Whole wheat or multigrain bread, 1 slice, provides 13 grams of protein. Dry pasta, 1 cup (macaroni), provides 13 grams of protein. Pistachios, ½ cup, provide 13 grams of protein. Feta cheese, ½ cup crumbled, provide 11 grams of protein. Cashews, ½ cup, provide 11 grams of protein. Bagels, 1, provide 10 grams of protein. White bread, 1 slice, provides 8 grams of protein. Milk, 1 cup (244 grams) provides 8 grams of protein. Peanut butter, 2 tablespoons, provides 8 grams of protein. Eat plenty of healthy carbohydrates (vegetables, fruits, whole grains, nuts, seeds, and legumes). Carbohydrates are the body’s preferred fuel source, and if you’re not taking in enough carbs, your body will start breaking down your muscles to get additional protein to use as fuel. When you eat sufficient carbohydrates, the protein you consume can be used for muscle repair and building rather than inefficiently fueling your workout, and your body won’t need to consume its own muscles to keep going. Avoid low-fat products, and prepare or purchase foods that include health-promoting fats whenever possible (olive oil and nut butters are particularly good). Some research suggests that saturated fats such as butter may not be as bad for health as experts believed in the past, and butter is certainly helpful for gaining weight. Avoid trans fats completely – while other fats are actually necessary for maintaining health, the trans (hydrogenated) fats that are found in a variety of processed foods offer no benefits and they increase your likelihood of developing serious health problems in the long term. There is a lot of variation in how bodies respond to different strength training programs and diets. Heavy weights, low reps (no more than 6-10), and compound exercises seem to be universally effective for gaining muscle, but the effectiveness of other elements of training programs and diets differ from one person to the next, so you’ll probably have to experiment a bit to discover what works best for you. There’s no need to overthink your approach. If you work out consistently, lift heavy weights, do compound exercises, increase the weight you lift regularly, and eat plenty of nutritious high-calorie foods, you should gain muscle mass over time. Fallon, S., & Enig, M.G., PhD. (2000). Why Butter Is Better. Weston A. Price Foundation, 2000. Collins, S., Reviewed by Melinda Ratini, DO, MS. (2015). Healthy ways to gain weight. WebMD.com. Holm, L., Reitelseder, S., Pedersen, T. G., Doessing, S., Petersen, S. G., Flyvbjerg, A., … & Kjaer, M. (2008). Changes in muscle size and MHC composition in response to resistance exercise with heavy and light loading intensity. Journal of Applied Physiology, 105(5), 1454-1461. Kerksick, C. M., Wilborn, C. D., Campbell, B. I., Roberts, M. D., Rasmussen, C. J., Greenwood, M., & Kreider, R. B. (2009). Early-phase adaptations to a split-body, linear periodization resistance training program in college-aged and middle-aged men. The Journal of Strength & Conditioning Research, 23(3), 962-971. Stark, M., Lukaszuk, J., Prawitz, A., & Salacinski, A. (2012). Protein timing and its effects on muscular hypertrophy and strength in individuals engaged in weight-training. Journal of the International Society of Sports Nutrition, 9(1), 1.